Scion works team, Papadakis Racing reached out to Andy recently to update the livery of their Scion tC Formula Drift car, which he originally designed back in 2011. 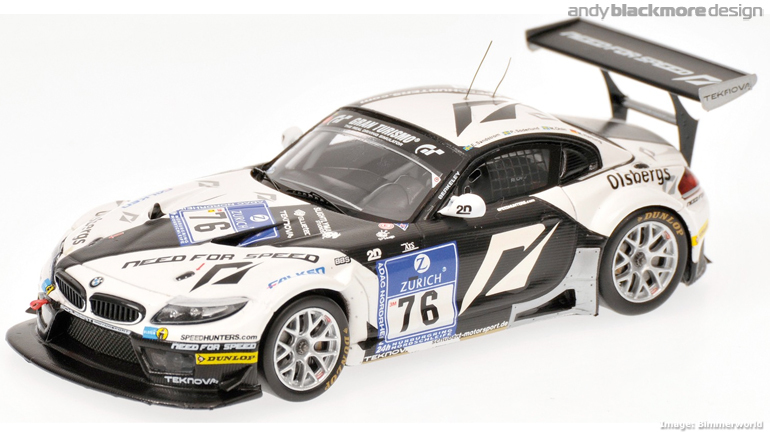 German Model maker, Minichamps has recently launched their two Schubert Motorsport BMW Z4 GT3 racecars from the 2010 Nurburgring 24Hrs. 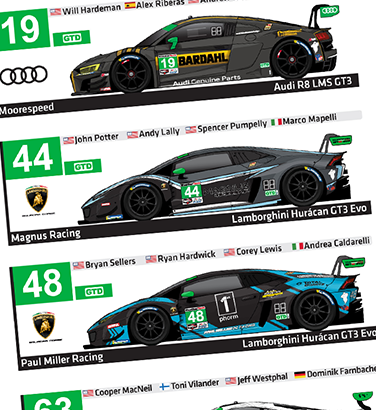 Both liveries were designed by Andy Blackmore and feature the now iconic asymetric Team Need for Speed livery. Minichamps and Spark Models will also be producing the 2011 cars, complete with wireframe livery and ABD branding on the boot! 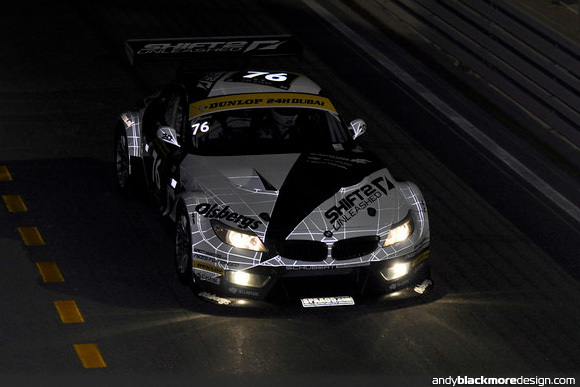 The 2011 Team Need for Speed livery on the Schubert Motorsport BMW Z4 GT3 made its debut with a convincing win at the Dubai 24 hours in January. The reflective livery was a photographer favourite during the event and received much praise on Need for Speed and Speedhunter’s Facebook and Twitter outlets. The livery features a unique wireframe graphic from the in-game car from Need for Speed Shift 2- Unleashed. The wireframe in the white areas is reflective, giving a unique look. More images and full details on Speedhunters’ Dubai coverage and on our BMW Z4 Livery Page..
As an added bonus, The Team Need for Speed BMW Z4, driven by friend Tommy Milner, Edward Sandstrom, Claudia Hurtgen and Augusto Farfus won the event by 3 laps. Two designs win Speedhunters Awards! The annual Speedhunters Cars of the Year Voting has recently taken place on Speedhunters.com, the car culture blog of video game, Need for Speed. Voted by readers, two cars designed by Andy Blackmore Design won awards. The Need for Speed Mustang RTR-X, designed with Vaughn Gittin Jr won the Demo car of the Year. Andy was also responsible for the livery of the Mad Mike Mazda RX-8 which won Pro-Drift Car of the Year. This comes shortly after the RX8 also won ‘Best looking Formula Drift car’ voted by the series and important individuals in the genre. Congratulations to Vaughn, Mike Whidett and to Twins Turbo, who built both cars! The Team Need for Speed/Red Bull Mazda RX-8, which Mad Mike Whiddett campaigned in the 2010 Formula Drift Championship won the ‘Best looking Car’ Award at the season banquet. The award was presented following voting by drivers, teams and industry figures. Andy worked with Mike on the livery, a variation of Andy’s BMW Z4 design for Team Need for Speed to include Mike’s Red Bull sponsorship. It was quite a challenge for Andy to incorporate both brands on the car. The look of the car is also helped by its low stance and its cool wheels which Mike and Twins Turbo designed. The Mazda and Nissan race in Formula Drift, while the BMW Z4 GT3 races in FiA GT3 and various VLN races including the Nurburgring 24 hours.